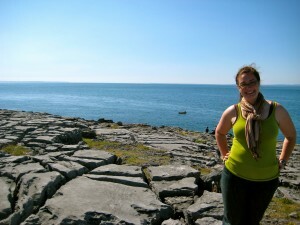 On Friday, we took a day trip from Galway to visit the Aran Islands. 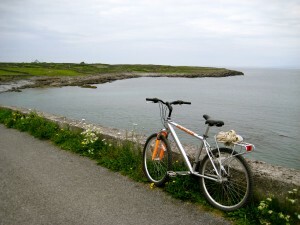 We rented bikes to ride around the largest of the three islands: Inis Mor. This path along the coastline was unbelievable!! 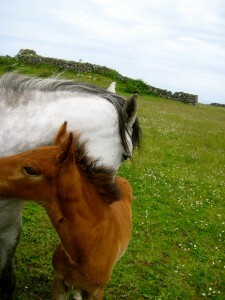 Another neat aspect of Inis Mor was all of the animals alongside the paths, including many newborns. We stopped to say hi to (and take pictures of) most of them, including this horse mother and son. The mama even had freckles (just like me)! The most spectacular part of the island are these cliffs, next to Dun Aengus (a prehistoric fort, first built around 2000 BC). They drop about 100 metres into the ocean below, and there aren’t any fences, etc. so we were able to go up the edge and sit, just watching the ocean pounding against the cliffs. Saturday took us to the Connemara region of Ireland, which is home to some stunning (and very diverse) scenery. 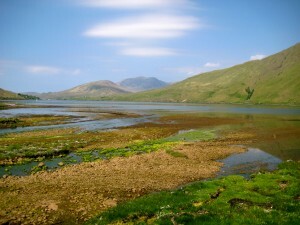 This, for example, is Ireland’s only fjord! 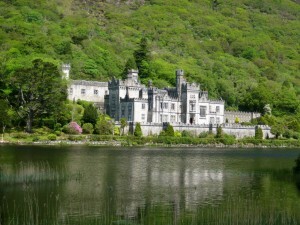 The main attraction in Connemara is the Kylemore Abbey… The setting of this abbey (now an all-girls school) is unbelievable, and there was also a beautiful walled garden up the hill that we got to visit. It was neat to see so many flowers in bloom since the perpetually 63-degree weather in Edinburgh makes me forget that it’s actually late May. 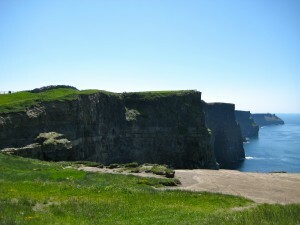 The third and final day trip that we took was to the Burren district and the Cliffs of Moher. 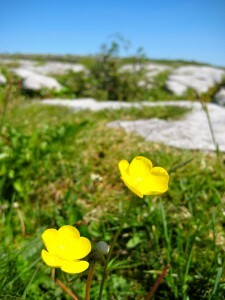 The Burren has all sorts of landscapes, but one of the most unique was the limestone slabs that you can see in the background of this picture. They made the whole area look, for lack of a better word, scaly! The cliffs themselves were unbelievable! They are slightly taller than the Aran Island cliffs, and the sun was shining on our visit. The area is much more restricted, though, so you can’t actually explore much of the cliffs themselves. 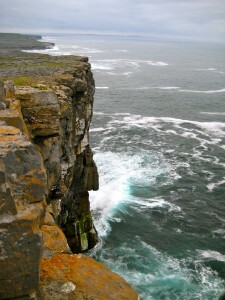 That’s me, enjoying the beautiful Burren coastline at Black Head! 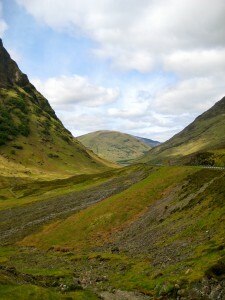 On Tuesday, after returning safely from Galway, I took a bus tour to the Scottish Highlands. It was a LONG day (8am – 8pm), but very worth it to see the beautiful sights of the highlands. 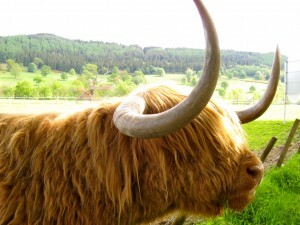 One of our first stops was to see Hamish, the ‘Hairy Coo’. He lives in this pasture with a female ‘coo’ named Heather, and he’s one of the oldest highlands cows around. Then, it was on to the good stuff! The colours of the different grasses/soils/rocks/shrubbery of the highlands was one of my favourite aspects of it, and I think this picture does a great job of capturing that. 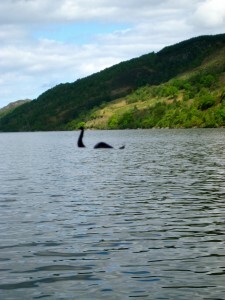 Finally, we paid a quick visit to Nessie… Of course, this isn’t actually the Loch Ness Monster (it’s just a cutout on the boat’s window), but we did actually go to Loch Ness. It’s the second-largest lake in Scotland, and we got to sail around a small portion of it. I hate to sound like a broken record, but it was beautiful! Other that these travels, my last few days have been full of running errands, and revisiting a few of the best parts of Edinburgh. It was the perfect way to spend my last week in Scotland. Right now, I have approximately 4.5 hours to kill before my taxi arrives to take me to the airport. Every once in a while, it hits me that I’m leaving and I get this sinking feeling in my stomach; ‘I’m not ready to leave! I’m not ready for this dream to be over!’, my heart says. Other times, though, I think about seeing my family in less than 24 hours, and I am beyond excited. I think that whoever created the term ‘bittersweet’ MUST have studied abroad. 🙂 I have learned so much this semester, and my largest goal is to not forget what I have learned about myself, my learning style, and my friends. I will work ardently to continue to grow when I return to Puget Sound for my senior year (and research this summer), and throughout the rest of my life, wherever my continued travels may take me. It’s been an honour sharing these experiences with you all, and I hope that my words have inspired at least one of you to study abroad as well. If you have any questions about studying abroad, or about Scotland, my offer still stands; please e-mail me! My Puget Sound address is aschoblaske@pugetsound.edu.